Sri Gopala Bhatta Gosvami, the forty-seventh branch, was one of the great and exalted branches of the tree. He always engaged in discourses about love of Godhead in the company of Rupa Gosvami and Sanatana Gosvami. Sri Gopala Gosvami was the son of Venkata Bhatta, a resident of Sri Rangam. Gopala Bhatta formerly belonged to the disciplic succession of the Ramanuja-sampradaya but later became part of the Gaudiya-sampradaya. 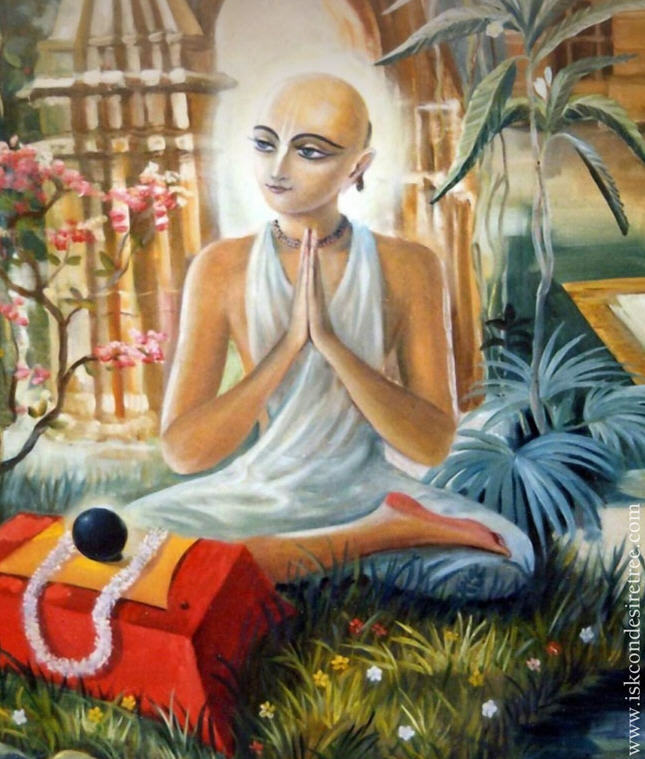 In the year 1433 Sakabda (A.D. 1511), when Lord Caitanya Mahaprabhu was touring South India, He stayed for four months during the period of Caturmasya at the house of Venkata Bhatta, who then got the opportunity to serve the Lord to his heart’s content. Gopala Bhatta also got the opportunity to serve the Lord at this time. Sri Gopala Bhatta Gosvami was later initiated by his uncle, the great sannyasi Prabodhananda Sarasvati. Both the father and the mother of Gopala Bhatta Gosvami were extremely fortunate, for they dedicated their entire lives to the service of Lord Caitanya Mahaprabhu. They allowed Gopala Bhatta Gosvami to go to Vrndavana, and they gave up their lives thinking of Sri Caitanya Mahaprabhu. When Lord Caitanya was later informed that Gopala Bhatta Gosvami had gone to Vrndavana and met Sri Rupa and Sanatana Gosvami, He was very pleased, and He advised Sri Rupa and Sanatana to accept Gopala Bhatta Gosvami as their younger brother and take care of him. Sri Sanatana Gosvami, out of his great affection for Gopala Bhatta Gosvami, compiled the Vaisnava smrti named Hari-bhakti-vilasa and published it under his name. Under the instruction of Srila Rupa and Sanatana, Gopala Bhatta Gosvami installed one of the seven principal deities of Vrndavana, the Radha-ramana deity. The sevaits (priests) of the Radha-ramana temple belong to the Gaudiya-sampradaya. Actually, one of the families entrusted with the Deity service at the Radha-ramana Mandir has a history of relations with the line of Srila Bhaktivinoda Thakura and Srila Bhaktisiddhanta Sarasvati. Visvambhara Gosvami’s father or grandfather had relations with Srila Bhaktivinoda Thakura, the family maintained relations with Srila Bhaktisiddhanta Sarasvati Thakura, and then Visvambhara Gosvami had very friendly relations with Srila Prabhupada. 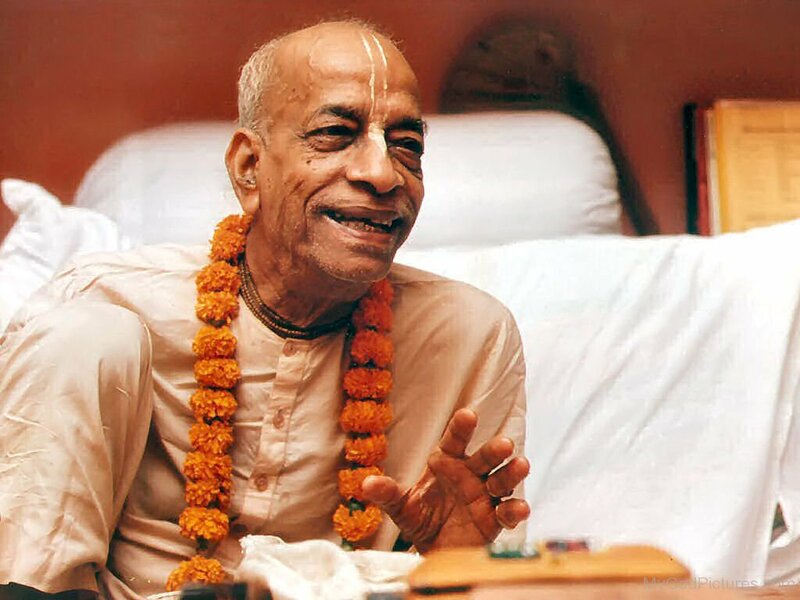 And he spoke very nicely about Srila Prabhupada. Now Visvambhara Gosvami’s son Padmanabha Gosvami is also very favorable to ISKCON. In fact, ISKCON devotees often honor prasada at his home at the Radha-ramana Mandir. I also took prasada there with His Holiness Tamal Krishna Goswami, and Padmanabha Gosvami showed us a letter that Srila Prabhupada had written to his father, Visvambhara Gosvami, about how all Vaishnavas should cooperate. So, not only does the Radha-ramana temple belong to the Gaudiya-sampradaya, but at least some of the sevaits have had close relations with the line of Srila Bhaktivinoda Thakura. When Krsnadasa Kaviraja Gosvami took permission from all the Vaisnavas before writing Sri Caitanya-caritamrta, Gopala Bhatta Gosvami also gave him his blessings, but he requested him not to mention his name in the book. Therefore Krsnadasa Kaviraja Gosvami has mentioned Gopala Bhatta Gosvami only very cautiously in one or two passages of the Caitanya-caritamrta. Srila Jiva Gosvami has written in the beginning of his Tattva-sandarbha, “A devotee from southern India who was born of a brahmana family and was a very intimate friend of Rupa Gosvami and Sanatana Gosvami has written a book that he has not compiled chronologically. Therefore I, a tiny living entity known as jiva, am trying to assort the events of the book chronologically, consulting the direction of great personalities like Madhvacarya, Sridhara Svami, Ramanujacarya, and other senior Vaisnavas in the disciplic succession.” In the beginning of the Bhagavat-sandarbha there are similar statements by Srila Jiva Gosvami. Srila Gopala Bhatta Gosvami compiled a book called Sat-kriya-sara-dipika, edited the Hari-bhakti-vilasa, wrote a foreword to the Sat-sandarbha and a commentary on the Krsna-karnamrta, and installed the Radharamana Deity in Vrndavana. In the Gaura-ganoddesa-dipika (184) it is mentioned that his previous name in the pastimes of Lord Krsna was Ananga-manjari. Sometimes he is also said to have been an incarnation of Guna-manjari. Srinivasa Acarya and Gopinatha Pujari were two of his disciples. Srila Gopala Bhatta Gosvami ki jaya! One story about Gopala Bhatta Gosvami is that on the eve of Nrsimha-caturdasi all the other Gosvamis and Vaishnavas in Vrindavan were preparing to worship their Deities and hold festivals. Gopala Bhatta Gosvami had only a salagrama-sila; he didn’t have a Deity with arms and legs and a body that he could dress and decorate. So, he was feeling deprived of the opportunity to serve like the other devotees who had Deities they could serve in these ways. And out of Gopala Bhatta Gosvami’s strong desire, a salagrama-sila became manifest in the form of Radha-ramana. Radha-ramana is considered the most beautiful Deity of Krishna. He is the one original Deity of the Gosvamis that has remained in Vrindavan, while the others had to be taken elsewhere for fear of the Muslim invaders. And near the temple of Radha-ramana in Vrindavan is the samadhi of Sri Gopala Bhatta Gosvami. Gopala Bhatta Gosvami’s uncle and siksa-guru was Prabodhananda Sarasvati. His samadhi is also located in Vrindavan, just off the parikrama path near Kaliya-ghata, which is quite near our Krishna-Balaram Mandir. So, often when we go on parikrama down the path near the Yamuna, we visit Prabodhananda Sarasvati’s samadhi and bhajana-kutira. And then we proceed to Srila Sanatana Gosvami’s samadhi. Srila Sanatana Gosvami was the most senior of the Gosvamis and was also a close associate and instructor of Gopala Bhatta Gosvami. In fact, Gopala Bhatta Gosvami worked with Sanatana Gosvami to produce the great treatise Hari-bhakti-vilasa. I feel that Gopala Bhatta Gosvami has been especially merciful to me on two occasions. On one, I visited his bhajana-kutira at Sanketa, a place between Nandagrama and Varsana where Radha and Krishna used to meet and sometimes perform rasa-lila. Gopala Bhatta would sit and chant underground in a deep cavern, accessible only through a long, narrow passage. At the end of the passage was a somewhat roomier place where Gopala Bhatta used to chant, now marked as his bhajana-sthala. I remember going there with Tamal Krishna Goswami and others on a very hot day and struggling to crawl through the passage to the bhajana-sthala. It was very difficult, but when I finally reached there, Gopala Bhatta Gosvami was very merciful. He allowed me to chant with a glimpse of taste. And after all the devotees emerged from the cavern, I stole back in. I crawled back to Gopala Bhatta’s lotus feet, and I sat there chanting. I will never forget his mercy to me there, and I pray that he will enable me to chant with relish and love. On the other occasion, the last time I visited Vrindavan, in Kartik of 1999, shortly before my surgery, I visited Gopala Bhatta’s samadhi near the Radha-ramana Mandir. 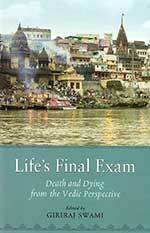 We arrived just after raja-bhoga–arati, and the pujari was closing the doors to the samadhi-mandira. But he was kind enough to open the doors for us, to allow us darshan of Gopala Bhatta Gosvami. He gave us some flowers and caranamrta, and invited us to stay for prasada. Thus our small party, along with some local sadhus, honored Gopala Bhatta Prabhu’s maha–maha-prasadam with great relish, and we even stayed to take a little rest before, filled with bliss, we continued on our way. So, Gopal Bhatta Gosvami is very kind. Years later, when some of my disciples from Bombay went to Vrindavan on pilgrimage, they visited the samadhi. They told the pujaris about me, how my health no longer allowed me to visit Vraja, and asked for some prasada for me. And one of the pujaris kindly gave them a piece of cloth from the samadhi. It is very special. Now, twice a year, once on his appearance day and once on his disappearance day, we bring it out and touch it. So now we shall pass it around and touch it to our heads and to our hearts—and pray to Gopala Bhatta Gosvami for his sublime mercy.